Is it important to you that the hybrid that you pick out has advanced technology features? Are you looking for something modern and new? 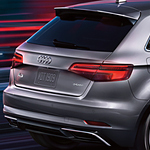 If so, you will appreciate the features of the Audi A3 Sportback e-tron, a popular compact hybrid plug-in. There is a special screen that is part of the Audi A3 Sportback e-tron and this screen provides you with easy access to features that will make it easier for you to drive. This screen is simple to use and you can access it and the features that it offers while traveling. There is an available audio system for the Audi A3 Sportback e-tron that allows you to use 14 speakers to listen to all of your favorite music on the road. If the quality of the music that you listen to while driving is important to you, you will appreciate the available sound system from Bang & Olufsen.